﻿Description: Arnica is a well-known herb used widely in Europe and traditionally grown & harvested in their mountains. 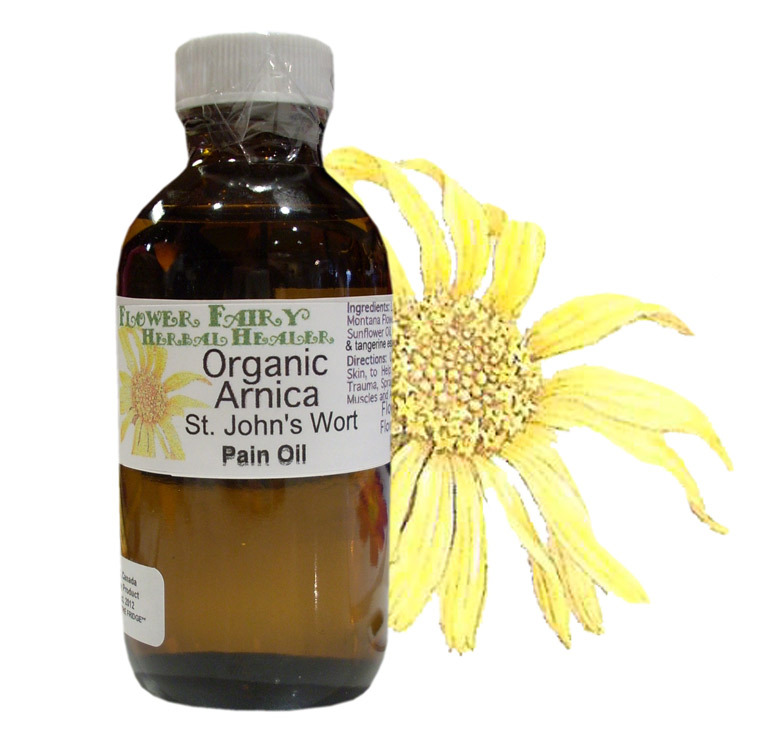 The Arnica Montana flowers are used to make a healing herbal oil that many practitioners, physiotherapists & athletes use for any non-open wound, sprain, bruise, bump, pulled muscle, or on sore, inflamed, over-worked muscles and joints. Great to help relieve those tense neck muscles that can lead to stress headaches or to use on tired or achy sore feet, or stiff sore low backs. St John's Wort is a well know nerve calmer & to ease pain & associated shooting nerve pain. It has been used effectively for sciatica, neuralgia, post shingles neuralgia. These makes a great blend complementing each other's properties to increase effectiveness. This is in the oil form with no bees wax added. It is more like a massage oil or similar to a liquid liniment style. The oil form has a silky texture with natural vitamin E oil added to increase it’s anti-oxidant content, healing potential & shelf life. Directions: Both the oil and salve are for external topical use only. Great to use as a therapeutic, extra-healing massage oil on tense, sore, aching muscles. Use on bruises, sprains & arthritis, tense neck muscles or on inflammation or sore joints. May speed recovery after exercise or trauma. Please do not use on open or bleeding skin/external use only! Effective for shingles' neuralgia, after the shingles sores are healed, to help with the associated nerve pain. To speed healing for shingles or herpes attacks use the Flower Fairy Cold Sore Balm first than after proceed to the Flower Fairy St. Johns & Arnica blend.